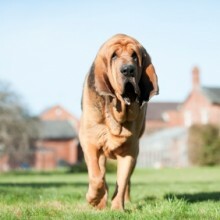 The Bloodhound is a very large dog, famous for his ability to follow a scent, particularly human scent, over large distances. He is a powerful dog, weighing about 50 kilos and would need a large house with a large garden. He should have plenty of exercise – more than two hours a day – and the opportunity to run free. He needs to be trained well, particularly in recall, to ensure that he doesn’t ‘lose’ himself following a trail. He has a loud bark but usually is not aggressive. His short coat needs grooming regularly. His long, pendulous ears can become injured whilst dragging along the ground following a scent. 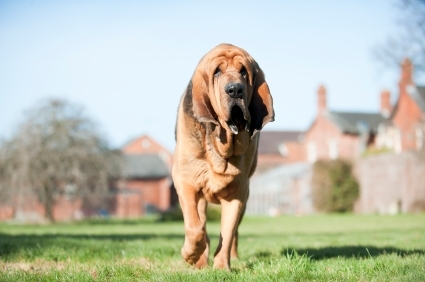 The Bloodhound is one of the 15 high profile breeds designated by the Kennel Club as requiring particular monitoring by reason of visible conditions which may cause health and welfare concerns.